Dandelion 8x6 oil on stretched canvas is signed by the artist Delilah.The art work is orginal and is protected by a clear glossy coat of museum quality varnish. Hafe Pear and Two Cherries this still life painting is signed by the artist Delilah.The art work is orginal and is protected by a clear glossy coat of museum quality varnish. 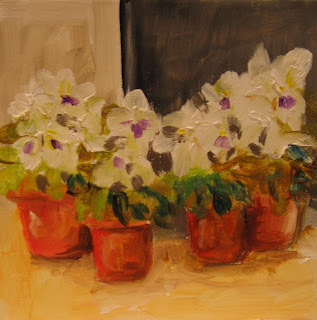 The Floral painting "Hollihocks with Color" Is signed by the artist Delilah. 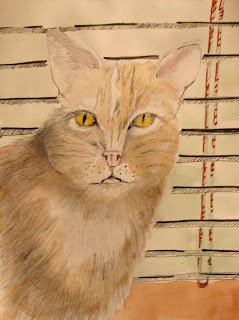 It is done in acrylics on paper and is matted ready to frame.The painting measures 12x18 and is matted to 16x20. 16x12 oil on stretched canvas ready to frame. 12x9 oil on paper matted to 14x12 ready to frame. 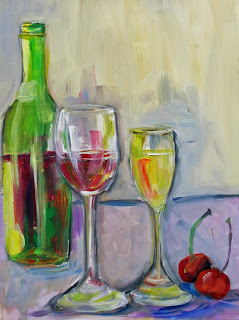 Wine and Cherries 12x9 oil on paper matted 14x11 ready to frame. This painting comes ready to frame. 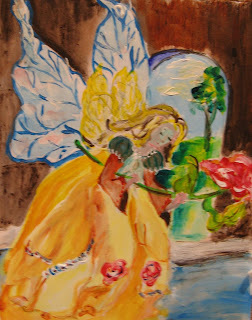 I picked a rose from my neighbors rose bush and as I sat looking at it this painting came to mind. My little nieces love fairies and princess. The bidding on this painting starts at $19.99. 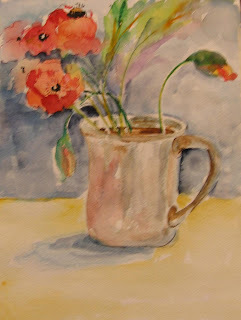 Cup Full of Poppies 6x6x1 1/2 oil on gallery wrapped stretched canvas wired and ready to hang. 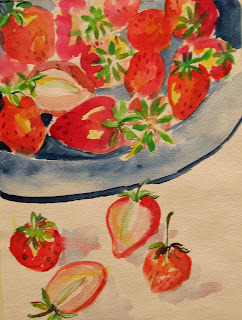 Three Strawberries by Delilah 6x8x1 1/2 on gallery wrapped stretched canvas wired and ready to hang. Three Lemons and one Orange on gallery Wrapped stretched canvas.6x12x1 1/2 gallery wrapped canvas stretched and wired ready to hang. 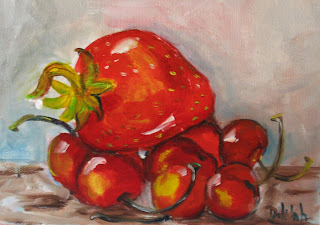 Strawberry and Lemon Oil painting by Delilah.This painting is 6x6x1 1/2 oil on stretched canvas. It is wired and ready to hang. Bright red strawberry right from the garden ready to eat yummy. This painting is a 6x6x1 oil on stretched gallery wrapped canvas, wired and ready to hang. Lime 6x6x1 1/2 oil on stretched canvas wired and ready to hang. 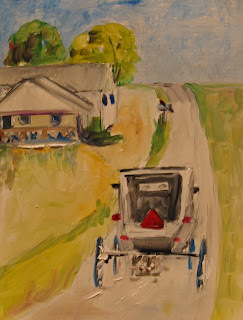 Original oil painting by Delilah. Three Raspberries 6x6 oil on stretched canvas. Wired and ready to hang. Great kitchen art. Among Friends original oil by Delilah. A lone cherry with raspberries on a white plate. 6x6x1 1/2 oil on stretched canvas. Wired and ready to hang. Peas and Carrots by Delilah kitchen art oil on stretched canvas ready to hang. Purple Iris 11x14 oil on stretched canvas. Bright red poppies in an abstract setting waiting to be picked. This painting is 12x6x1 1/2 oil on stretched gallery wrapped canvas wired and ready to hang. It's a party. Cup cakes with cherries by DELIALH. If your on a diet these are cup cakes with zero calories. They are just yummy eye food. 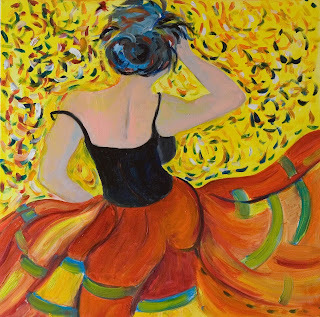 The painting is a 11x14 oil painting on stretched canvas. watercolor on 140 lb watercolor paper ready to frame. 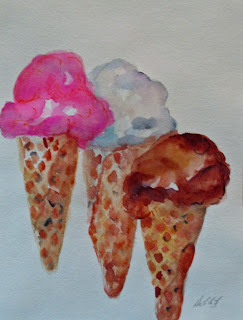 When the days are warm ice cream is the best. 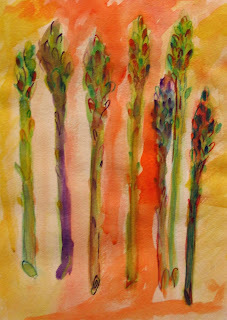 Asparagus is a perennial plant native to central and southern Europe, northern Africa and western and central Asia. It is a member of the lily family, which includes plants such as onion, garlic, leeks, turnips, lilies and gladioli. Wild asparagus was loved by the ancient Greeks but it was the Romans who first cultivated it. The Emperor Augustus coined the phrase ‘velocius quam asparagi conquantur’, meaning to do something faster than you can cook asparagus. Julius Caesar first ate it in Lombardy and wanted it served with melted butter. And in the time of King Louis XIV asparagus was dubbed ‘The King of Vegetables’. 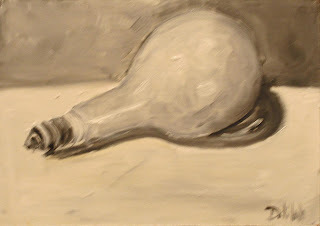 This is number 122 in my daily painting series and comes matted.